Downtown Loveland Winter Wedding - Christmas + Twinkle Lights for the WIN! Erin + Rai’s wedding was exactly what they wanted - surrounded by their closest friends and family at a place Erin grew up. Their wedding was different for me though, their faith was heavily featured and it was at a high school gymnasium - Campion Academy. Now, by different, I am not saying that it was anything bad - it was unique, not only for them, but a unique experience for me. They are Seventh Day Adventist, which after much googling, I have come to understand as a Protestant branch of Christianity where its believers live a life devoted to Jesus Christ, have a Sabbath (day of rest) on Saturdays, and have a diet free of caffeine, alcohol and most meats. I found all of this so interesting - still do! The place they were married in Loveland is the Seventh-day Adventist high school campus that Erin’s father runs and the house Erin grew up in is also located on the campus. 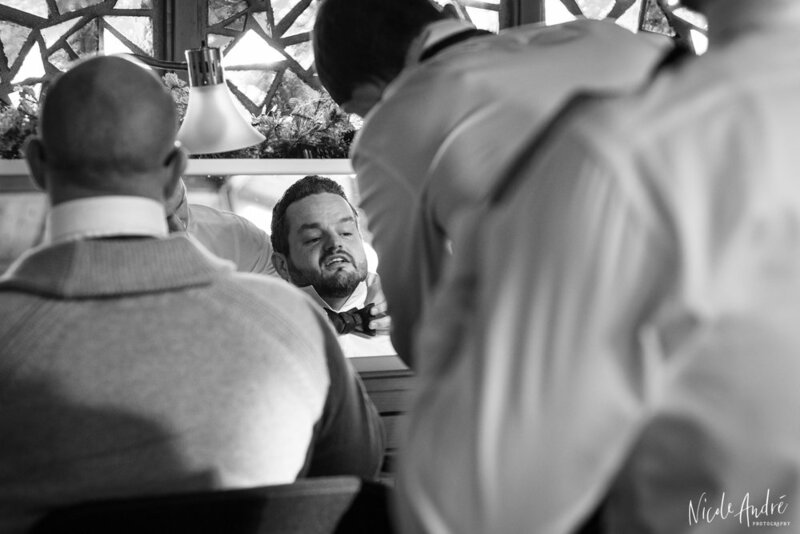 Their wedding day couldn’t have been more about them and their story. During the getting ready time, Rai told me they had been having a long distance relationship for the past year because his mother became ill. After he finished his PhD, he moved to California to help the family and make sure his mom recovered - what a great son! Erin remained in Colorado with her family to finish school, spend time with friends, and to plan their wedding. 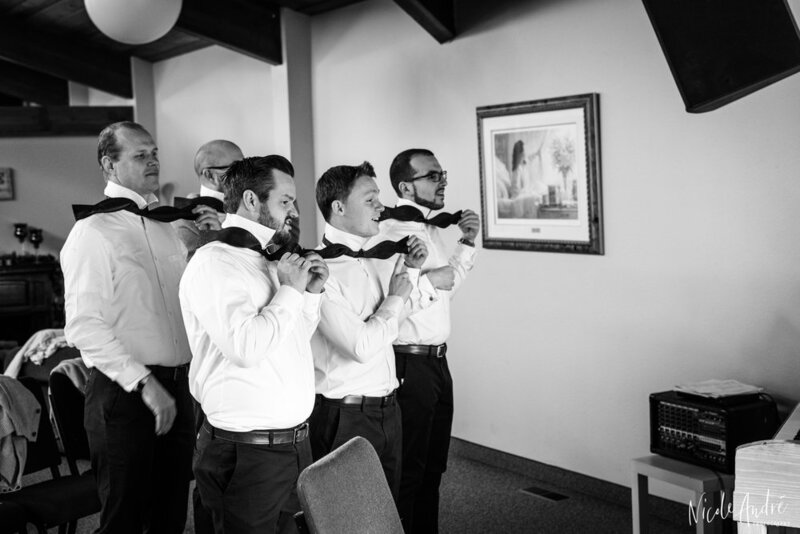 His groomsmen spent at least an hour trying to figure out how to tie a bowtie from this YouTube video. It sounded like I was at the zoo because each step relates to an animal - parrots, elephants, fish - and I don’t remember the rest. Rai also made mention of his socks that he wore specifically for Erin - they had The Kiss by Gustav Klimt on them - one of Erin’s favorite artists. Before the ceremony, we did a first look, family photos, bridal party photos and then drove to Devil’s Backbone and Downtown Loveland for bride and groom portraits. Then we moved into the gymnasium that Erin had decorated for their ceremony and reception. It was full of twinkle lights, paper flowers, foxes, lockets and so much more that represented Erin, Rai and their relationship. During the ceremony, they participated in a foot washing ceremony which was something I hadn’t witnessed before. They took turns kneeling in front of the other and cleansing eachother’s ankles, feet and toes. From there, they put their socks and shoes back on, read their vows and exchanged rings. This lead them into the reception where many of the guests brought desserts to add to their community dessert table, a vegetarian meal was served from Garbanzo, and the bride and groom drank from an Irish cup that had been passed down in Erin’s family for generations. Thank you to Erin + Rai for such a beautiful wedding!